Do we really need multiple live versions, in variable sound quality, of songs such as “Purple Love Balloon” or the Morrissey inspired “Only (a Prawn in Whitby)”? Yes, we do. Cud completists won’t need convincing, and newcomers will find plenty to enjoy in this beautifully produced four-disc package, containing material recorded for local and national radio from 1987 to 2006. Cud began life when a group of fine art students from Leeds Polytechnic retrieved a battered drum kit from a skip. Lead singer Carl Puttnam sent a demo to John Peel, leading to their first BBC session. 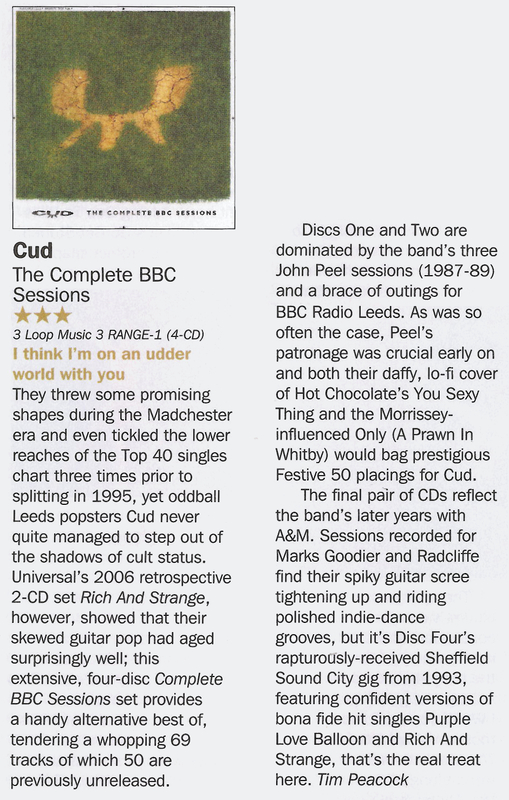 Cud’s rise was meteoric, but the band split in 1995, reforming in 2006 to publicise a greatest hits compilation. They’re still going strong. So many of these songs are still very, very funny – Puttnam’s lyrics are consistently witty, and his larger than life vocal style never irks. The best Cud songs are noisy flashes of poetic gold, wearing their erudition lightly. One listen to “I’ve Had it With Blondes” should convert the uninitiated.